It was a rather inconvenient time to lose my sunglasses this weekend. With the sun bright and scorching my poor sensitive eyes are crying for shade. So yesterday I embarked on a sunglasses mission to find something new for my face this summer. 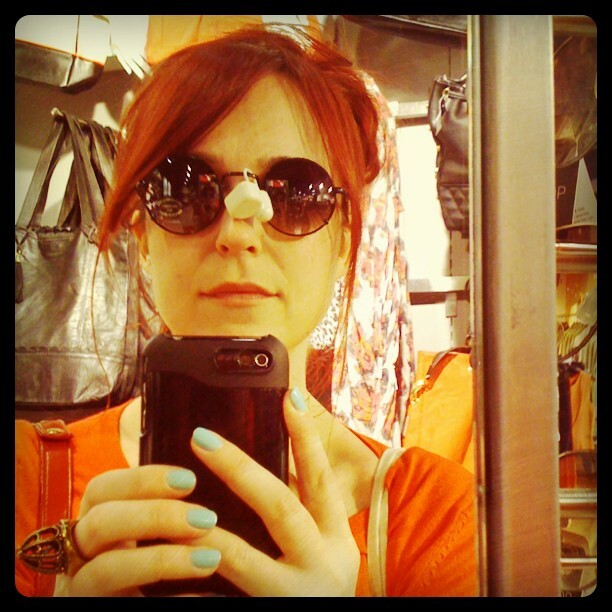 Under the strict instruction of our dear Domestic Sluttery Editor I also posted several ridiculous photos of myself trying on the sunglasses. Security tags have never looked so hot. 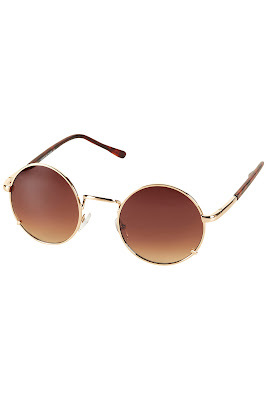 Surprisingly I find myself drawn to these round sunglasses. Usually I am an oversized aviators kind of girl, but there is something rather nostalgic about this pair. Suddenly I was transported back 15 years to my teenage self. I quite like them. They are £16 from Topshop. What do we reckon, yay or nay to the 90s-esque sunglasses? As for the sunnies, I just can't bring myself to dress like I did when I was 15. It makes me feel too old to see 15 year olds now that do it! That said, they look fab on you! I like the glasses and think they look fab on you but they just make me think of Liam Gallagher and so I couldn't face wearing them myself. Maybe it is time to reclaim the round glasses from all that is Gallagher? I yay them for you but my face is too broad for them. I need enormous Hepburn style sunnies! They're identical to ones I wore when I was 16. Probably because I was an Oasis fan. For those two reasons it's a no from me. I'll leave the 90's revival stuff to the new teens.